Sitting across the aisle from a renowned digital marketing strategist and speaker on a daily basis has tendency to allow you to take for granted the knowledge stockpile that is just a few feet away. Tuesday was a good reminder of that. When Lee Odden, CEO of TopRank Marketing, promised the crowd at the 2017 Digital Summit Minneapolis 45 minutes of content in his 25-minute closing keynote, he was not joking. Eloquently arranged into this 25-minute time frame, Odden opened eyes of marketers to the still-in-it’s-infancy-field of influencer marketing, and how influence can literally supercharge marketing programs. But, don’t take the summary from just me, his desk neighbor. Audience members let me wrangle them on the way into post-conference happy hour to share their favorite parts of the presentation too. In 1900, cars zoomed down the road at a blistering 45 MPH. Within 8 years, a car could travel 100 MPH. How? The supercharger: a seemingly magical collaboration between oxygen and the automotive engine causing unheard of increases in horsepower and torque. How do you supercharge your marketing? By adding your own supercharged–influencers. Influencers provide valuable, trustworthy content and incredible amplification opportunities you couldn’t otherwise realize. How much added “horsepower” can you see from influencer marketing? When you think of influence, if you think of Kim Kardashian holding a product, think again. What are the basic steps to implement influencer marketing? The audience members I spoke with also appreciated Odden’s sneak peek into three steps for implementing influencer marketing. Activation: Start the conversation and build relationships. Listen to influencers and align on what you have in common. Co-creation: Develop content together. Compose a goal and make it fun and easy for influencers to participate. Amplify: Provide influencers with ammo to share your content. Make it easy and show them how it benefits them. Lee also added ongoing influencer nurturing is the like the rinse and repeat of this three-step shampoo bottle. If you’re in B2B, don’t let maturity of use in the industry intimidate you. Start creating your influencer marketing strategy today to get ahead of the curve. Is this a pay-to-play space? Brands large and small, deploying successful influencer marketing programs have seen success using completely paid, completely organic and a mix of paid and organic efforts with their influencer programs. The best choice will be dependent on your business goals and the value your influencers will receive. In my pre-happy hour prowling, I also learned the audience loved hearing about the three types of influencer engagements and the powerful examples of each Odden shared. Microcontent: Short-form quotes, tips or insights from individual influencers added to brand content. Campaigns: Longer-form content contributed by individual influencers often as a part of a larger campaign. Community: A dedicated group of influencers that contribute a variety of short- and long-form content for brand communications. Microcontent can be quickly produced by asking influencers questions centered around keywords. Wa-laah, just like that, you have a keyword-centered answer ready to gain rankings. Microcontent can show up in many formats as an ingredient to a bigger piece: from influencer roundup blogs and SlideShares to adding snippets within a brand-developed piece of content. Once you’re “dating” your influencers – okay that doesn’t sound right – once you’ve nurtured your influencers and grown the relationships, you can begin to engage them in campaigns. Within a campaign, you’ll want to map content against the stages of a purchase journey. Think about the genuine questions your target audience is asking. What’s keeping them up at night? Then decide from whom each answer should come: your brand or an influencer. It’s important to select influencers who are aligned with your message so both parties gain the full value of an influencer campaign. If you aren’t on the same page, the brand won’t relay the correct message and the piece won’t be as valuable to the influencer which will likely decrease their amplification and deter future collaboration. Influencer integrated campaigns are where you really see that supercharge in action. In one impressive B2B example Odden shared, with the use of gated assets, long-form interview blogs and social promotion, a brand drove 200,00 views, 4,000 downloads and over 1,000 leads! Or try another B2B brand who with the help of just one – but impressive – influencer, Shep Hyken, drove $570,000 in qualified sales leads and $1.5 million in projected pipeline revenue in 30 days! Catch your breath. I know, that blew me away too, and I sit next to the team who designed and executed the latter example. A structured formal influencer community is a sign of a mature influencer program. In this situation, influencers know (and are likely proud) they are part of the brand’s influencer community. Influencers are asked to contribute to short- and long-form content for brand communications at a regular cadence. There may or may not be a paid component to being a part of a structured influencer community. But even if there reimbursement, it’s not like what Lebron pockets from Nike, or one-off tweet (an estimated $185k). Influencers become and stay a part of a brand’s community because their beliefs and values align with the brand’s. And because participating provides them with value. Odden cited the Adidas Tango Squad as an effective example of a B2C influencer community. Squads of 100-250 youth ages 16-19 in 15 cities worldwide are looped into exclusive content and new product releases before it goes live elsewhere. Adidas stands by their investment arguing content is far more authentic if you give it to 500 kids with 2,000 followers compared to a global influencer with a million followers. Community’s also work strikingly well for B2B: think employees, execs, clients, industry thought leaders, media and analysts. Influencer marketing is not a task or even a project. To fully gain the value of the supercharger, integrate influencer marketing in every step of your marketing planning, execution, measurement and optimization. Ready to supercharge your marketing but not sure where to start? We’d love to help. Learn more about our influencer marketing services or reach out, today. 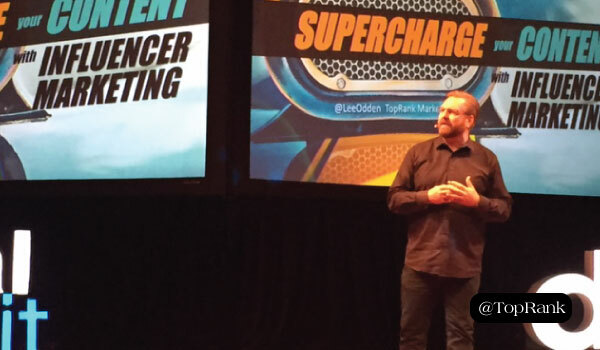 The post Lee Odden Shares Ways to Supercharge Your Content with Influencer Marketing appeared first on Online Marketing Blog – TopRank®.